From our humble farm beginnings 45 years ago we have recognised the importance of the local community. How to work with them in a mutually respectful manner and support local and market specific initiatives to have a positive and lasting impact on the lives of those who live and work in our communities. We get involved with many different community projects and charity events, with depots nationwide it means we are involved in many diverse projects through out the UK. 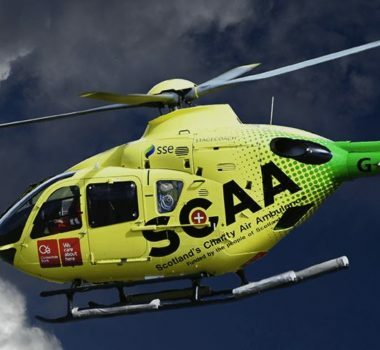 We are keen supporters of Scotland’s Charity Air Ambulance (SCAA) which launched from our premises at Perth Airport on 22nd May 2013. From the base they are well positioned geographically to reach 90% of Scotland’s population within 25 minutes. SCAA are also ideally placed to reach some of Scotland’s remotest areas within a 15 to 30 minute timeframe. 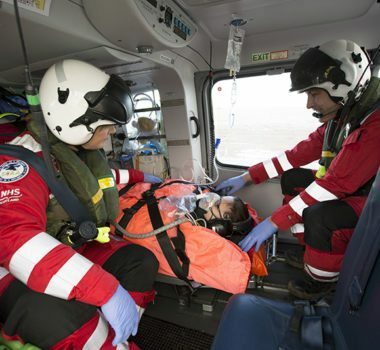 They fly to time-critical emergencies across Scotland and rely 100% on funds from the public to ensure they are available 12 hours a day, 7 days a week. We also support their fund-raising initiatives through providing utility vehicles for their donation collectors, providing free promotion at different Morris Leslie events and organise our own charity collections for this great cause. Get involved in SCAA’s exciting Give Us Five campaign! As a service provider to the construction industry we are supportive of a number of related charities, including Construction Week and the Lighthouse Construction Industry Charity. We have provided machines (telehandlers, excavators and rollers) to help our customers deliver Construction Week which was initiated and organised in conjunction with the Lincolnshire Training Association. This event is an annual event which is held at the Lincolnshire Showground to help introduce the construction industry to local school children in the hope to get more young people involved in the industry. We are also delighted to be corporate sponsors of the Lighthouse Charity’s flagship event. The only charity that provides financial and emotional support to the construction community and their families who have suffered an injury or long term illness or simply need a helping hand. They also promote safety initiatives aimed at avoiding accidents and improving safety on site and support educational and training initiatives.